It feels great to finally finish something! Mods: Unintentionally, I missed out the grey stripes between the colour changes in the first section. I am not fussed about this. I had plenty of yarn in the end. I am very pleased with this. 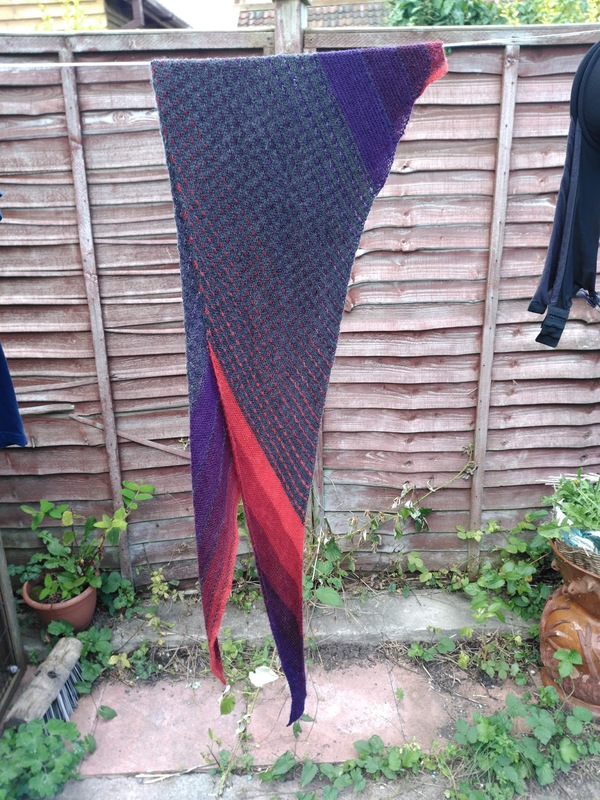 To begin with, I thought the grey was too dark to make the colours really pop, but I then considered what state a pale grey scarf might get into after a few weeks of hard wearing and being thrown into all kinds of bags with all kinds of other things. Dark grey was a good choice. I also started to think I should have used a larger needle, since it was not especially big for a shawl; but the blocking has helped a lot with that (big surprise). 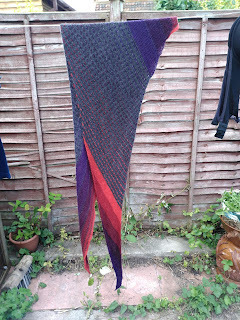 The picture is of it hanging wet on the line - I will attempt to take a better picture when it is dry. Now I just need to finish off the linen top I started way back in May and I can move on to chunky, warm, winter sweaters.